XIX: Boy Band Simulator is a visual novel/raising sim/rhythm-action game that affectionately lampoons modern boy bands and the culture that surrounds them. The player takes on the role of Aigburth, a fresh-faced graduate from the prestigious “Boy Band Academy,” as he gears up for the big debut of XIX, his rather curiously named boy band. Through mastery of the game’s interlocking systems, the player must guide Aig through both his personal and professional lives, ensure the success of his band, and ultimately set the course for the rest of his career. With XIX, we wanted to make a game that would bridge the gap between fans of narrative games and fans of more systems-focused games while still being engaging and accessible to both. To accomplish this, we combined conventions from visual novels, raising sims, and rhythm-action games to create a unique gameplay loop wherein the player’s system knowledge, hand-eye coordination, and ability to understand and connect with the game’s characters are all put to the test. The constituent pieces of the loop are very simple, but together they create a complex interlocking system that rewards players for engaging with every aspect of the game. In this way, no matter what side of the spectrum you approach the game from, XIX provides you with both a fair challenge and a comfort zone to fall back on. The theme of boy bands, while originally chosen somewhat arbitrarily, ended up being the perfect fit for the type of game we wanted to make. The stark contrast between the levity and poppiness of boy bands in popular culture against the almost absurd darkness of the industry behind closed doors provided us with the ideal setting in which to write a story that is light, comedic, and accessible, while also providing rounded characters and meaningful insights for those willing to delve deeper into the world. 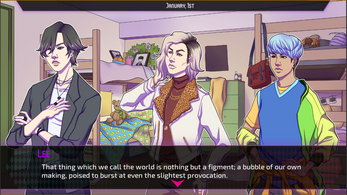 Not only that, but the vivid iconography and exuberant fashion found in boy band culture proved to be a wonderful source of visual inspiration, and enabled us to create unique environments and character designs that perfectly complement the frenetic energy of our constantly shifting gameplay. 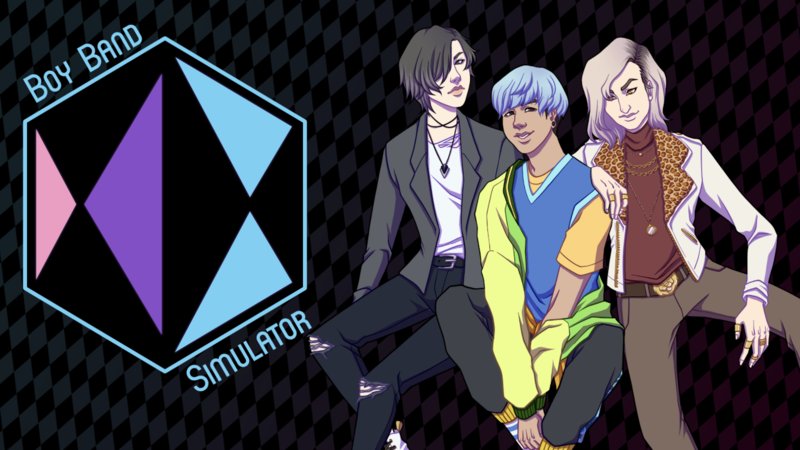 Just like the music and personalities that inspired it, we hope that XIX: Boy Band Simulator will appeal to people from all walks of life. Regardless of your previous experiences with games, or lack thereof, we hope that you will join Aig, Lee, and J-Pe on their rise to superstardom! XIX: Boyband Simulator is currently in development. Please enjoy the downloadable demo! Mouse to navigate and make selections during visual novel and scheduling. Do you have any updates on this game? I really enjoyed playing this. It's a wonderful blend of visual novel and gameplay! The demo was super fun. All of the art is stunning, and the boys themselves are great. I like that Aig has a distinctive personality. when the full version will come out? I can't wait to learn more about the boys! Will you only be able to control's Aig's schedule in the full game? Also how did they not know thier band name when it was already stitched into thier performance outfits? can we create our band with our name? Unfortunately, probably not. XIX as a band name is pretty integral to our overall narrative, and we've already generated many assets with the logo on it already. I failed! So stressful to make a band with jerks!